Rundi (fourth left) officiates at the ground breaking ceremony for the construction of the new building for the SJAM-KPS haemodialysis centre in Bintulu as Low (fifth right) and others look on. The approved site for the construction of the new building is located at Parkcity Commerce Square Lot 3066 & 3975. Low said the new centre will initially be equipped with 42 dialysis machines and it will be upgraded from time to time. The current centre in Tanjung Batu has 65 patients and more than 10 new patients on the waiting list. There are 10 qualified staff nurses and six nursing aides manning the centre. Meanwhile, SJAM-KPS chief operating officer Datuk Yeo Kim Thong in his speech said its dialysis service began in Klang, Selangor in 1993 with just two dialysis machines catering to the low and middle income group and charging nominal fees. “Today we are operating 16 dialysis centres nationwide – with more than 210 dialysis machines and more than 550 dialysis patients under our care and the number just keeps growing,” he said. 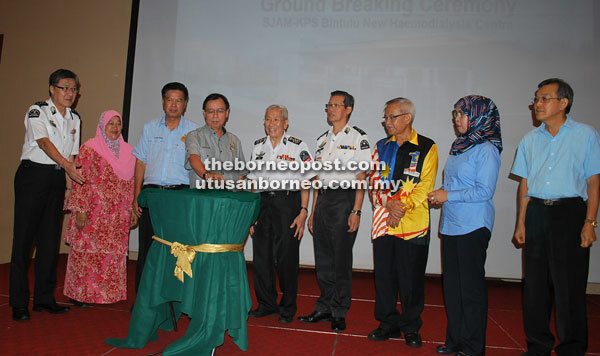 In Sarawak, he said SJAM-KPS started its centre in Sibu–the foundation’s 8th dialysis centre–with 10 dialysis machines on May 1, 2006 and today, this centre is operating with 60 machines and is presently the biggest in the country. However, he said once the new centre in Bintulu is completed, it will be its biggest centre. “Our estimated cost to build this complex and to equip the centre with dialysis machines and other supporting equipments is RM5.5 to RM6 million. “I hope local corporations, community clubs or individuals will step forward to support this meaningful charity project,” he added. In the meantime, he also expressed his gratitude to BDA general manager Rodziah Morshidi and her team for their untiring support and also to the state government for approving its land application in the interest of the local people. “Indeed, the Sarawak state government is truly a people’s government,” said Yeo. Dr Rundi on the other hand advised people to start living a healthy lifestyle by looking after their food intake and to exercise. He observed that now even people aged 30 and below were not exempted from having health problems, and this is fearful fact is reason enough to start living healthily. Once the centre is completed, he believed that it would be of great help to patients from low and middle income groups, especially from the rural areas. “Before the setting up of the centre here, these patients have to fly to Kuching for haemodialysis treatment which is a burden for them,” said Dr Rundi. He said implementing these projects was not an easy task for SJAM-KPS as a non-profit organisation but they were able to carry out their social services up till now through their staff’s highest commitment and dedication. SJAM-KPS is non-profit organisation with core activities in providing community social services. It also conducts leadership training, workshops, seminars and teambuilding for its officers and members. Its three main services are first-aid training for the public, ambulance services and haemodialysis services. Currently, SJAM-KPS haemodialysis centres employ more than 170 full-time staff consisting of medical assistants, staff nurses and dialysis aides. During the function, Dr Rundi who is Kemena assemblyman also handed over minor rural project grants under the state constituency totalling RM215,000 to five organisations. Also present at the event were Assistant Minister for Infrastructure Development Datuk Talib Zulpilip, Samalaju assemblyman Majang Renggi, SJAM chief-of-staff (operations) Datuk Lai Zee Ming, deputy state president of SJAM Selangor Ho Thiam Hock, deputy state commander of SJAM Selangor Neow Peng Teck, area president of SJAM-KPS Datuk Dr Lim Sin Boon and SJAM-KPS area vice-president Gew Chen Hsiang.